Easter is a lovely time. 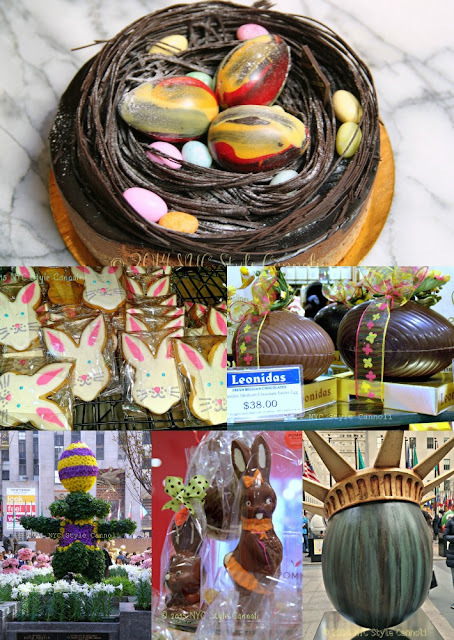 We are hoping to get into the warmer weather in the East, and we get to enjoy chocolate as well as wearing a fancy hat. When I was little, my Uncle worked for a greenhouse, and he always brought me my Easter corsage Easter Sunday morning. My Mom made many of my clothes, she knew how to sew very well, and I always looked my Easter best! I made my first Easter pizza by myself and it came out pretty well. I guess working with my Mom making it for so many years, you do learn even though you don't realize that is happening. You can read all about the Italian Easter Pizza HERE. I have very fond memories of the holiday with my family, I am hoping to start a new tradition by spending the holiday in New York City. If you follow me on Instagram, you will be able to see what I come across during my stay. 10. Macy's Flower Show - usually runs each year during this time, March 25 to April 8, 2018 and the them this year is "Once Upon a Springtime".